****½ Death Drop by Alina Adams. Mystery. Whoops. This is the 4th in this figure skating mystery series. I read the 3rd, Axel of Evil (#18), loved it, and promptly bought the first two. Unfortunately, they're still sitting in my TBR pile. 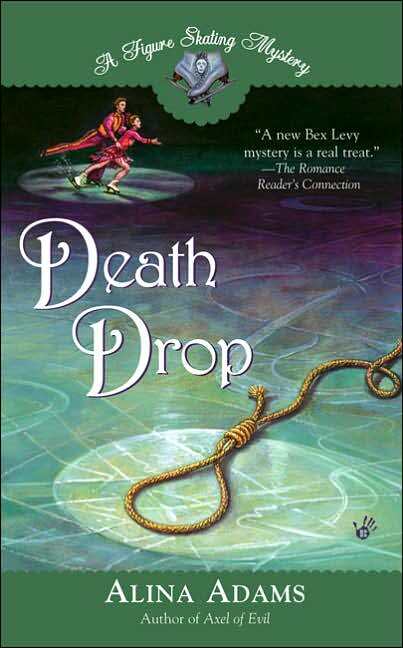 Fortunately, not having yet read them didn't affect my enjoyment of Death Drop in the slightest, even though some events from previous books are referred to. The setting is Nationals, when a baby is found abandoned after an ice dancing practice session, and the presumed mother, former ice dancing champion Allison Adler, is discovered hanged in the costume room. It's soon evident that she was murdered, and once again, figure skating researcher Bex Levy finds herself in the middle of a murder mystery. Everyone wants the baby: Allison's estranged father; her married coach, who claims to be the baby's father; and her former boyfriend Coop, who also claims to be the father. Coop's mother in particular is determined that her son be granted custody, reasoning that single fatherhood would be good for his image. And as many reasons as there are for the various custody claims, there are even more motives for murder. It seems everyone has a secret, but all secrets are not necessarily lethal ones. In addition to the murder and paternity issues, there's a nice thread involving Jeremy, the young skater from On Thin Ice, and his father Craig, who's a possible romantic interest for Bex. As with Axel of Evil, I thoroughly enjoyed this story. The skating details were just enough to ground me in the setting and to make me feel like a bit of an insider, but not enough to be overwhelming. Bex is a realistic, likeable heroine, and all the secondary characters were well-enough developed that even though there were quite a few of them for a relatively short (233-page) book, I didn't have any trouble distinguishing them. The only thing that gave me a little trouble was figuring out Coop's secret--I got a bit confused about that by the end, between the truth, the spin, and what various characters believed. That could, of course, be attributed to late-night reading. I had an awfully hard time putting this down. Amateur detective series tend to have trouble giving the protagonist reasons for continuing to stumble on and/or poke their noses into murder cases. So far, that's not a problem. I particularly liked the way Bex's involvement in this case was handled. One last thing: I didn't expect this while reading a cozy murder mystery, but the bits about fatherhood and what it means, especially one particular conversation between Bex and Craig, put a lump in my throat and tears in my eyes.